The ring finger of the left hand. "Which finger is the wedding band worn on?" is a question that many couples ask. The answer largely depends on where the couple lives, however in the US most couples still embrace the tradition of wearing a wedding band on the ring finger of the left hand. In many cultures, wedding bands are traditionally worn on the ring finger of the left hand. This tradition is thought to have started with the ancient Romans. The Romans believed the left hand represented love and romance because the veins bringing blood to the fingers came directly from the heart. A ring, therefore, that is worn on the left hand was said to bring good fortune in romance and marriage. This tradition remains strong today in many countries still embracing the wearing of a ring on the left hand to signify marriage and commitment. While countries such as Brazil, Britain, Canada, France, India, Italy, Japan, Mexico and the United States follow the custom of wearing a wedding ring on the left hand, there are many cultures who wear the wedding ring in different ways. Couples in countries such as Colombia, Germany, parts of Spain and Venezuela, typically wear the wedding band on the right hand. Many Orthodox Christians wear the wedding band on the right hand. Therefore answering the question "which finger is the wedding band worn on?" will depend on a couple's heritage and culture was well as the country that they live in. There is no reason why a couple should follow the traditions and wear a ring on their left hand. 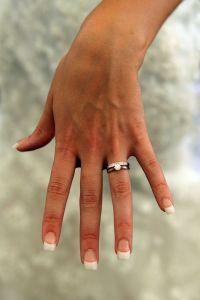 One way to demonstrate a couple's commitment in an unusual way is to wear wedding rings on other fingers. This can often be for practical reasons as well as purely making a statement. Many left handed people find wearing a ring on their right hand a more practical alternative to wearing a ring on their left hand. This is because rings worn on the lead hand often receives harder wear and tear. Another way for a couple to demonstrate their individuality is to wear different styles or types of wedding bands. The range of different wedding bands today is extremely varied. Whereas at one time the most common wedding band would be yellow gold, today wedding bands can be made of almost any materials from precious metals through to hand carved wood. Wearing a very unconventional or unusual ring on the traditional finger is a great way to marry the old with the new, or the traditional with the unconventional. A number of people have professions where wearing rings is either dangerous or simply not practical. People who operate machinery or have manual jobs, may find that wearing a ring around the neck on a chain is a safer alternative to wearing a ring on the finger. This may be a good solution for other people who find wearing a ring on a finger impractical. A couple doesn't have to wear a ring to show their commitment. When some couple's ask "which finger is the wedding band worn on? ", they can be under the misunderstanding that wedding bands have to be worn on a certain finger or that a wedding band has to be worn in order for a marriage to be legal or recognized. The fact is that couples don't have to wear a wedding band and, if they so wish, any item of jewelry or special token can be exchanged to signify their wedding and celebrate the marriage vows. Alternatives to rings include bracelets, necklaces and even a special wedding tattoo. Deciding which finger to wear a wedding ring on is a very personal choice and is part of what makes a marriage truly special.